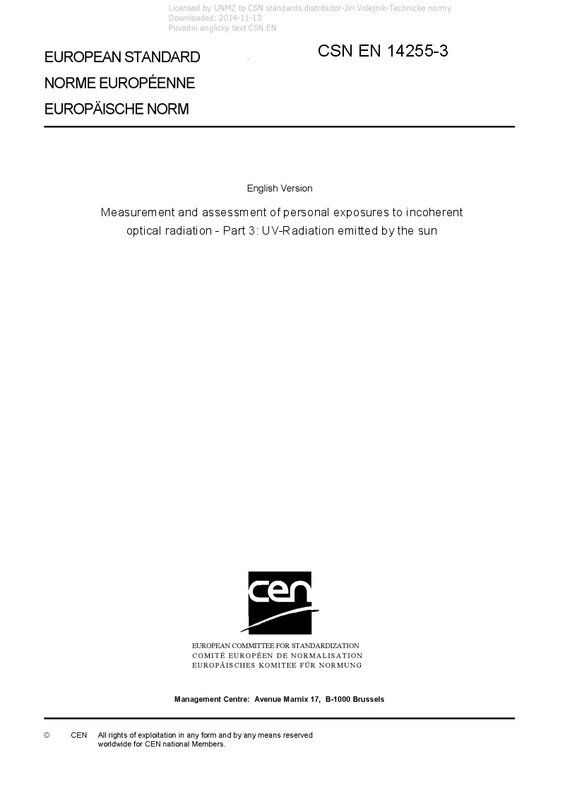 EN 14255-3 Measurement and assessment of personal exposures to incoherent optical radiation - Part 3: UV-Radiation emitted by the sun - This European Standard specifies procedures for the measurement or estimation and the assessment of personal exposures to ultraviolet radiation emitted by the sun. NOTE 1 According to CIE 17.4 UV-radiation is defined as an electromagnetic radiation with wavelength between 100 nm and 400 nm. Due to atmospheric absorption only solar UV-radiation in the spectral region between 280 nm and 400 nm reaches the earth's surface in significant amounts. This European Standard applies to solar UV-exposures when staying outdoors. This European Standard is applicable to workers and to the general population. This European Standard does not apply to UV-exposures caused by artificial sources, e.g. UV-lamps, welding arcs. NOTE 2 Part 1 of this European Standard deals with UV-exposures caused by artificial sources. NOTE 3 For radiation emissions of products other standards apply, such as CIE S 009 for lamps and lamp systems, EN 60335-2-27  for sunbeds, EN 60335-2-59  for insect killers and EN 12198  for radiation emissions of machinery. This European Standard does not apply to radiation exposures which concern the retina of the eyes. NOTE 4 Ultraviolet and visible radiation exposures of the eyes may result in photochemical damage to the retina (this is often called the blue light hazard). The associated action spectrum contains mainly visible radiation and only a very small contribution in the ultraviolet region. The determination and assessment of radiation which may result in a blue light hazard may be done in accordance with part 2 of EN 14255 .